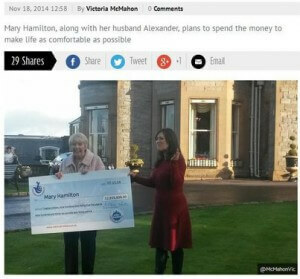 Mary Hamilton has been playing the lottery since it started 20 years ago, and she just knew that one day she may win a few thousand pounds; she was wrong. The Euromillions lottery pulled a pleasant surprise when one of her tickets won a £12,935,936.30 jackpot in the November 07 draw. She found out when she went to the Jet filling station on the Shore Road to purchase tickets and get her previous tickets checked. The clerk said they could not pay her winnings at the store and asked her to contact the lottery offices. Then a person in the store did a check through his mobile phone which confirmed she was a big winner. She and husband Alexander are set on making life as comfortable as possible for the both of them and their families. The also plan to give to the community, move to a new home and do a bit of traveling. But first order of business is to buy a new phone.